Do you own a business? Then, there are certain services and amenities that you should always keep readily available at your disposal because you never know when and why you might need them. One such useful service is the commercial electric services. Look for a commercial electrician who has immense knowledge and experience in the electric systems not just in the residential department but also the commercial spaces like offices, hospitals, airports, restaurants, churches, shopping centers, and so on. We, at JPEG Inc. Electrical Contracting, can be of help. We have well-trained and knowledgeable electricians who have the license to meet all kinds of electrical needs. Owing to our emergency services and sprawling knowledge, we have been able to create a solid customer base in areas like Fort Lauderdale, Hollywood FL, Miramar FL, Plantation FL, Sunrise FL, or Weston FL. So, if you need an electrician for your office, you can rely on us. 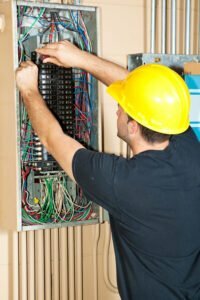 Here, we have put together a few reasons why a commercial electrician is important. Take a look. First of all, being a business owner, you would not want to disrupt the productivity of your workplace. Power cuts, short circuits, and the failure of the electric light, HVAC system, or other communication and data lines can cause a major disturbance in the workflow, thereby affecting the productivity of the employees and the sales revenue of your company. Next, you should understand that an emergency comes without a warning. You never what kind of issue crops up in your electrical systems. Sometimes, these might get aggravated to an extent that it causes fatal accidents as well. In order to avoid such a scenario and mitigate the situation at the earliest, you should hire a commercial electrician. So, if you think we can help you with the electrician you need, then quickly get in touch with us today.